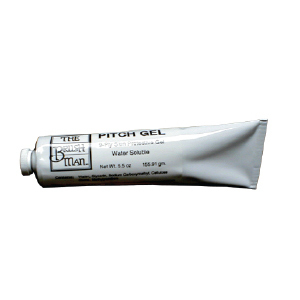 Protective Pitch Gel, 5.5Oz Tube. PRODUCT: PROTECTIVE PITCH GEL, 5.5 OZ. TUBE. PRICE/TUBE. DESCRIPTION: General Purpose water-soluable skin protection gel you rub into skin. Helps protect skin from pitch burn, bitumen fumes, asphalts, coal tars, plasticizers, polyester resins, chlorinated solvents, ketone-type solvents, phoenolic resins, epoxy resins, rubber accelerators, rubber adhesives vegetable oils, transformer oils. Water soluable. May be removed with ordinary soap and water. PACKAGING: 5.5 oz. re-sealable squeeze tube.